Deep underground, in the heart of Neopia, lies Moltara, a land of steam and gears founded to keep the planet's unstable core in check. Unfortunately, the millenia-old machines that keep the place running are in constant need of maintenance, and the ancients didn't exactly leave instructions. With that in mind, I hope you're ready to do some codebreaking! Oh, I do hope there will be gears! When the game begins, you will be presented with a machine fitted with a series of gears surrounding a large red button. The gears are separated into several sections, each bearing a colored rune. To form a code, click on the section of a gear to the left or right of the top-center to rotate it; the sections that make up the code will be those at the top. To submit your code, press the large red button. It's, um. It's a bit easier to understand when you're actually playing. At the top of the machine are several light bulbs, which indicate whether any of the runes in the codes you submit are in the correct place. A green light means that a rune is in the correct place, a yellow light means that the code contains a correct rune but in the wrong place, and a red light means that the code contains an incorrect rune. Note that there's no correlation between the positions of the lights and the positions of the gears; if the first two lights are green, it only means that two runes are correct, not that the first two gears have the correct runes. In each stage, you will be given twelve attempts to solve the code, as indicated by a gauge to the left of the light bulbs. If you use up all of your guesses before solving the code, the game will end. There are two ways to earn points in Clockwork Codebreaker: by discovering the correct placement of a rune, and by solving a code. Each correct placement is worth 30 points, while the reward for solving the code increases in each stage. 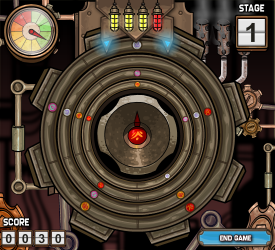 If you manage to solve the code in Stage 3, you'll have scored the maximum of 1000 points, and earned the Clockwork Codebreaker gold trophy. When solving, always shift runes in the same direction to keep track of them more easily. If you have trouble remembering rune placements you've decided won't work, try writing down your findings or taking screenshots. Unlike Time Tunnel, which has a very similar style of gameplay, you're not timed in Clockwork Codebreaker. Feel free to take as long as you need! If you find yourself stuck or at a loss for what to do next, try arranging the gears as you had them on the previous round and try again. This section covers the logic behind solving the codes in each level. While your codes will be different than the ones seen here, our explanations should help you understand the process behind breaking the codes. Stage 1 Step 1In the first stage, the machine will have four gears, each with four runes and a blank space. Since the blank spaces can be used in the code, we'll start by pressing the red button to see if the code contains any blank spaces. Stage 1 Step 2One of the lights turned green, while the others turned red; this means that there's a single blank space in the code. Unfortunately, there's no way of knowing which gear it should be on, so for now all we can do is choose a gear to leave blank and turn the other three to a rune. For the sake of simplicity, throughout this guide testing will always start from the bottom gear. Stage 1 Step 3The lights show one green, one yellow, and two red. This means that the blank space is in the wrong position, but that one of the white runes is correct. Knowing that both the blank space and white rune must be on one of the top three gears, let's again go from the bottom up, making the bottom gear purple and moving the blank space up one. We'll leave the third gear white, and change the top to purple. Stage 1 Step 4With three yellow and one red light, we now know that one of the gears should have a purple rune, but that none of the runes are in the correct positions. We still don't know which of the top three gears the white rune and blank space should be placed on, so let's move them each up one. The purple doesn't go on either the top or bottom gear, so we'll place it on the second from the bottom, and change the bottom to orange. Stage 1 Step 5Three yellows and a red again. Fortunately, this tells us everything we need to know to solve the code. Since the blank space must be on one of the top three gears but didn't work on the middle two, it can only go on the top. The purple didn't work on the top or bottom gears before, and didn't work on the second-from-bottom just now, so it must be on the second from the top. We already know that the white rune worked in one of the top three before, and since we've decided to place the blank and purple in the other two, it can only go on the second-from-bottom gear. Finally, we got a red light on the orange rune, meaning that the only thing that can be placed on the bottom gear is the red rune we haven't yet tested. Stage 1 Step 6With that, the code has been solved, and we can move on to Stage 2. Stage 2 Step 1In the second stage, there are five gears with seven symbols that can be used in the code. This makes it slightly more difficult, but the logic behind solving the code is the same as it was in the first stage. As before, let's start by submitting all blank spaces. Stage 2 Step 2With more runes than before, it's more likely that any individual one won't be used in the code. This code happens to contain no blank spaces, so let's shift all the gears to white. Stage 2 Step 3There aren't any white runes in this code, either. While you might consider yourself lucky in a situation like this, don't forget that the code is still more complex than the one in the first stage, and that we're not much closer to solving it. For the time being, let's give the purple runes a try. Stage 2 Step 4Finally a clue for the code: one of the gears should have a purple rune. This doesn't tell us much however, so as in stage one, let's leave the bottom gear purple and turn the rest to violet. Stage 2 Step 5The green and yellow lights tell us that the purple rune is in the wrong spot, but that one of the violets is placed correctly. Let's move the purple up one, and since we know that the violent rune doesn't go at the bottom, we'll leave the middle one in place. We'll try yellow runes on the rest of the gears. 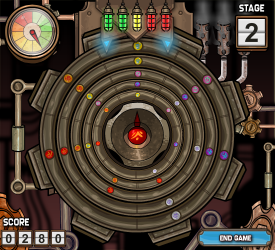 Stage 2 Step 6As we can see from the lights, two gears are showing the right runes, while another is out of place. Since only one is out of place, we can infer that one of the yellow runes is right. We know that neither the purple nor violet go on the bottom gear, so let's try the yellow rune there. It's impossible to be sure whether the purple or violet is in the correct place, so we'll have to test it: let's move the violet up one, and switch out the unused yellows for orange. Stage 2 Step 7Two of the lights remained green, while two still show yellow. From the red light we know that one of the orange runes isn't part of the code, so we'll have to change one of them to red. Since there are two out of place while there was only one out of place last time, it's likely that the violet should either be moved back down with an orange replacing where it currently is, or moved up to the top gear. We're still not quite sure where the violet is supposed to be, but we have plenty of attempts remaining, so let's try it in the top spot. Stage 2 Step 8As it turns out, that was the correct code! When you're unsure about which runes should go where, it's best to move as few as possible per turn, so that you'll know which changes might have affected the code. If you try to change several at once, you're likely to confuse yourself, which could be a step in the wrong direction. Stage 3 Step 1The third and final stage in the game has six gears, and an intimidating nine possible code components. While this stage may seem daunting, just remember the process used to figure out the code. Let's start by submitting all blanks. Stage 3 Step 2No blank spaces in the code. Let's try the white runes. Stage 3 Step 3In the third stage, you can expect to see codes containing only one of a certain rune fairly often. Moving right along, we'll leave the white at the bottom, and switch the rest to purple. Stage 3 Step 4As we've seen before, the white is on the wrong gear, while one of the purples is correct. There's no way to know where either goes at the moment, aside from neither belonging on the bottom gear, so let's put them on the second and third from the bottom and try the violet runes. Stage 3 Step 5Neither is in the correct spot, and the code contains no violet; let's move them up yet again, and give the blue runes a go. Stage 3 Step 7While one of the gears does definitely have a green rune on it, the results are less than conclusive. For now, all we can do is try the purple rune on the top gear, and switch the extra green ones for yellow. Stage 3 Step 8This is a much better result. All but one of the lights showing as yellow tells us that nothing is in the correct place, and that the purple and one of the greens were right last time. The white rune doesn't go in any of the bottom three slots, so we'll move it up one. It's hard to be sure where the yellow and green are meant to go, or what the final rune should be, so let's try orange on the bottom, with green above that, and yellow at the top. Stage 3 Step 9Based on half of the runes being correct, and which we know the correct and incorrect placements of from the last few attempts, the only possible placements for the green and blue runes are the bottom and second-to-bottom gears, respectfully. This leaves the orange rune to fill the next gear up, which should be the correct solution to the code. Stage 3 Step 10There you have it. By process of elimination, we've determined the correct code with a few rounds to spare. If you've encountered any problems while reading this guide or playing the game, refer to the Quick Tips section above.